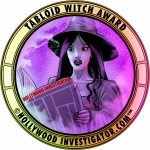 [HollywoodInvestigator.com] It has all the ingredients of a traditional horror anthology film. Four tales, each featuring a traditional monster: vampire, witch, werewolf, zombie. There's even blood and gore. Yet The Shadows of Ants doesn't feel like horror. Its violence doesn't frighten so much as repel. It's too gloomy, permeated by a Sundance Channel, indie film authenticity. Its characters mostly bicker about their interpersonal issues. Only slowly do we learn of their supernatural traits, which appear ancillary to their lives. "Growing up I loved anthology horror films and TV shows," said Ants writer/director Paul Davis to the Hollywood Investigator. "One thing I wondered, though, was why they always focused on straight horror or horror/comedy, instead of investing in the characters' lives and trying to make us feel something through them. Of course, many anthology films want to make you feel other emotions besides laughter and fear, but it was rare. 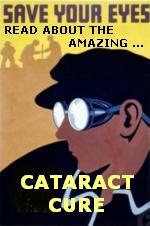 "I thought a cool idea would be transplanting these types of stories into the real world. To take archetypical movie monsters and examine what their lives might be like if they actually existed. How their relationships would be, what scares them, makes them laugh and cry, turns them on, etc. Focusing on the smaller aspects of their personal lives, I filmed in normal-seeming houses and apartments, places we all live, hoping to add to the authenticity and further suspend the audience's disbelief about nonexistent creatures. 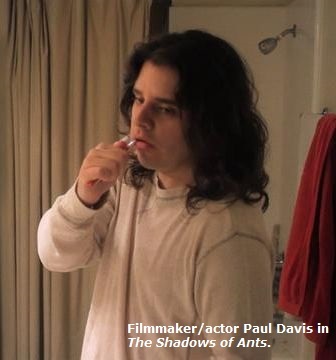 "Since The Shadows of Ants focuses on characters and their emotions, I consider the film a drama foremost. I think the other genre the film falls into is fantasy. We're thrown into these worlds and, before what these people are is explained to us, we accept them as people. Once the fantasy elements come out, we're hopefully already invested and accept the events. "I think of the film as drama/fantasy. With a little horror thrown in, to keep things interesting." The Shadows of Ants's first two tales are thematically identical. A sympathetic person is revealed to be a monster -- a vampire and a witch -- whereupon a mortal human comes to kill and rid the world of their kind. The theme of bigotry against The Other is hardly subtle, so that the film suffers from a heavy-handed liberal moralism. The third story is more morally ambiguous and balanced between monster and mortal, and thus the most interesting and enjoyable. A werewolf is married to a mortal woman. He kills. She wants him to stop. Along they way, they lie to each other, and argue, as with any married couple. The fourth tale has a traditional zombie setup. Brother and sister are barricaded in a house while a zombie plague rages outside. They pass the time by discussing their parents and upbringing, but their revelations and personal issues are less dramatic than in Ants's previous three stories. "I'm glad you liked the third story most," said Davis. "In many cases audiences feel that since it's the bleakest, with the least warmth or hope, it is enjoyed less. I, however, love dark stories, and this act is also my favorite. Who's Afraid of Virginia Woolf is one of my favorite movies. I wanted to capture the tone of a relationship that should be over, but the couple is still going through the motions. A relationship which, for one reason or another, just doesn't end. The resentment of each escalates by the day, month, year, until the relationship is so unpleasant that fighting is the only thing they do well anymore." Many horror anthology films have a connecting story, its brief vignettes closing and introducing the main tales. But instead, The Shadows of Ants separates its tales with poetic interludes, an unseen narrator reading verse over shots of scenic beauty. Evoking Saturday Night Live's Deep Thoughts, the technique risks imparting an artsy pretentiousness to Ants. It's certainly not what most horror fans expect. As Davis explains his interludes, "I wanted a stark contrast between the reality of the stories, people talking how people actually talk, and the narration, which is theatrical and grandiose, a style in which nobody would actually speak. I wanted Ants to sound like two different writing styles you might see on stage. A sparse, naturalistic style of people interacting -- and the poetic, exaggerated style you might see in a completely different production. "Another reason is that each act reflects a different Shakespearian play, either in theme, story, or symbolism. I wanted something that vaguely sounded like it could have come from one of his plays. "Of course, another reason is that what the narrator is saying is masked in the language. That way the audience can either listen closely to the transitions, to try and get a clue or hint about the theme or idea of the next act. Or it can simply use those few moments as a breather to decompress from the previous story, if their brain doesn't want to do any of the legwork. "The transitions take us from early morning to night. Since each act is set during a different time of day, we were able to light the movie in distinct ways to make each story feel separate. The acts get darker. The first one is the lightest, the cutest. Then they slowly get heavier. The tone gets darker. The film gets darker. "The big thing I feel that most people will pull out of The Shadows of Ants is the theme of death. The movie parallels the passing of a day with the passing of a life or lives. The day starts and things feel good, possible, bright. But as the day passes and slips into night, the course of that day might have not been a great one. "There were other ways I differentiated the acts. Act 1 (the vampire) doesn't use handheld cameras. Everything is locked down on tripods and dollies. Throughout Acts 2 and 3, things get looser and shakier as things become unhinged. By Act 4 (the zombies) the entire movie is handheld. The film grain gradually gets heavier through each act. It was fun to figure out little ways to make each act feel unique. "I was also trying to examine how time of day, the position of the sun or moon, can affect our moods, alter shadows in ways which influence our minds, affect our decisions. Sun and moon are constant things we don't give much thought to throughout the day or night, but they are typically extremely important in the lore of many monster films." The Shadows of Ants's beautiful cinematography was shot on a Canon 7D by Dan Schmeltzer, and color corrected in DaVinci Resolve by Peter Swartz. Editing was done on Final Cut 7. The film was shot in California -- Sherman Oaks, Silverlake, and Long Beach -- and Arizona. Mostly indoors "to feel more intimate and real" and avoid costly location permits and related fees. People involved in the film donated their homes. Paul Davis self-financed his film, with help from his mother "who is awesome and supportive," and a Kickstarter campaign for post-production funds. "I majored in film production, but this was the best film school I could ask for." Although Davis also acted in his film, he consider himself a filmmaker first. "I enjoy acting, but I have a much better time behind the camera than in front of it. I do act, but usually when asked or out of necessity. In this film it was a lot simpler to play a certain role that had a lot of demanding aspects instead of expecting someone to do if for little to no payment. The Shadows of Ants is seeking distribution. "We're working on online distribution through the more prominent online vendors at the moment. Hopefully soon it will be able to stream on computers from all over. We have our fingers and toes crossed.